LEXINGTON, Ky. (Oct. 29, 2018) — University of Kentucky student singers in the Women’s Choir will perform a world premiere of "Your World" by composer Joan Szymko with poetry by Georgia Douglas Johnson in honor of the UK School of Music 100th anniversary season 7:30 p.m. Friday, Nov. 2, in the Singletary Center for the Arts Concert Hall. A part of the Singletary Center Signature Series, the performance will be conducted by Lori Hetzel, associate director of the school, and will feature special guests Paws and Listen. Joan Szymko is a composer and conductor from the Pacific Northwest. With a catalog of over 100 published choral works, her music is performed by ensembles across North America and abroad. Abundant lyricism, rhythmic integrity and a vigorous attention to text are hallmarks of Szymko's diverse and distinctive choral writing. Fresh and inspiring, her text selections are as notable as her music. Especially significant is Szymko's contribution to the body of quality literature for women's voices. Her music is frequently heard at regional, national and international choral festivals and competitions. Since 2003, her music has been performed at every national conference of the American Choral Directors Association. The ACDA recognized Szymko's lasting impact on the choral arts in America by selecting her as the recipient of the prestigious Raymond W. Brock Memorial Commission in 2010. Composing for vocal ensembles is an extension of Szymko's creativity as a choral director. She has inspired community and church choirs in Seattle and Portland for over 30 years. Her passion for the singing voice, an embodied approach to sound, a dedication to craft and artistry, and her insistence on quality texts — all relate to her experience as a conductor and are reflected in her choral compositions. In addition to her own self published works, her music appears in the catalogs of Santa Barbara Music Publishing, Roger Dean Publishing, Walton Music, earthsongs, Treble Clef Press and Yelton Rhodes Music. Szymko is a founding member of the Independent Music Publishers Cooperative. 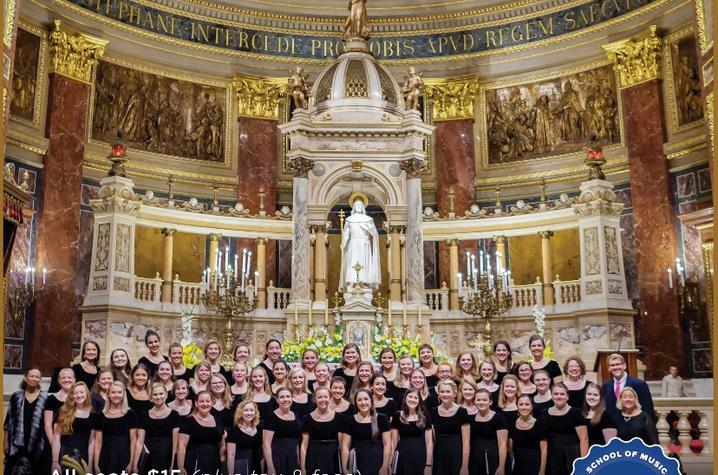 The UK Women’s Choir is a select ensemble composed of over 100 of the school’s most talented female voices conducted by Hetzel, associate director of choral ensembles at UK. These singers, ranging from freshmen to graduate students, represent a variety of musical backgrounds and academic disciplines. The choir’s challenging and diverse repertoire includes literature spanning from Gregorian chant to eight-part music of the 21st century. With an emphasis on music by female composers, the ensemble performs works of many different languages and compositional forms. Growing in size over the past 15 years, the group has performed both nationally and abroad. Most recently, at the 2013 ACDA National Conference and a 2015 tour of cathedrals in Spain. UK Paws and Listen are an a cappella singing group of 16 women auditioned from the Women's Choir. They perform pop music as well as a mix of doo-wop, vocal jazz and show tunes. The ensemble is coached by undergraduate music education majors and advised by Hetzel. This group is highly esteemed both on and off campus. They perform for numerous prestigious events throughout the year and are often featured at high profile events at the home of the UK president. Tickets for the UK Women's Choir concert are $15 plus processing fees and sales tax. Tickets can be purchased from the Singletary Center ticket office by phone at 859-257-4929, online at www.scfatickets.com, and in person at the venue. Free advance tickets for UK students with a valid ID are available at the Singletary Center ticket office up to the day before the concert during operating hours. UK Women's Choir and Paws and Listen are part of the School of Music at the UK College of Fine Arts. The school, currently celebrating its 100th anniversary, has garnered a national reputation for high-caliber education in opera, choral and instrumental music performance, as well as music education, music therapy, composition, and theory and music history.